I had the good fortune to meet koto virtuoso Satsuki Odamura in the early 1990s, not long after she moved to Australia from Japan. Through numerous collaborations with Satsuki, especially in the ensembles Waratah and GEST8, I became enchanted with both the koto and Satsuki’s superb playing of it. As I was generating ideas for this piece, I realised that 2018 marks the 30th Anniversary of Satsuki’s arrival in Australia. Fortuitously, the 30th Anniversary symbol of a pearl beautifully represents the precious creativity of Satsuki. I consulted Yuko Yamamoto and other members of the Satsuki Odamura Koto Ensemble to help with incorporating this imagery into my composition. The musical elements of the composition flowed from this central idea. All the rhythmic material in the composition is built around cycles of the number 30. A happy co-incidence is also that the total number of strings on the koto (13) and bass koto (17) is 30! The piece unfolds from a very delicate opening where koto harmonics cluster like tiny pearls (somewhat like Satsuki’s initial steps to introduce koto music to Australia), gathering momentum and rhythmic energy leading up to Satsuki’s passionate improvisation towards the end of the composition. The tuning for Gogatsu No Shinju is inspired by one of my favourite pieces from Waratah’s repertoire, Satsuki’s composition Mbasera. 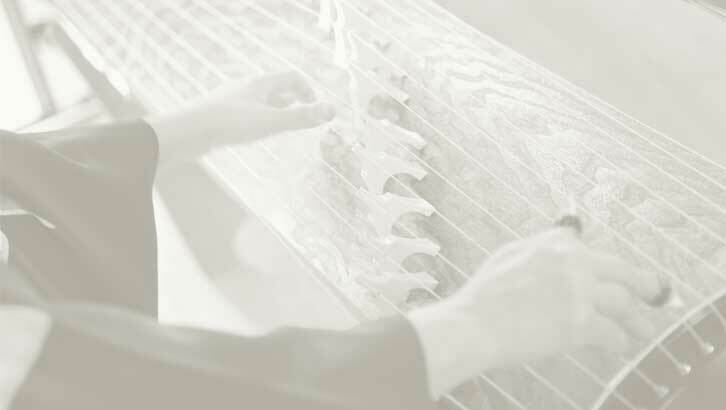 Satsuki formulated the koto tuning for Mbasera after listening to recordings of the kora (West African harp). It is joyous and uplifting; I hope it is a fitting sound with which to celebrate Satsuki’s 30th Anniversary in Australia, as well as the evolution of the wonderful koto ensemble and community she has created in this country.